Strong health leads to stronger brains. Having a balanced life is important for overall success in one’s career. As you look around the office you may notice that many of your colleagues have a few pounds to lose. However, what is most striking is the dangerous nature of being out of shape, having stress, and working many hours. It can lead to heart attacks and other types of ailments. This can take a toll on your overall work performance as well as raise medical costs. Even if you are approaching middle age it isn’t impossible for you to get into great shape. The only question should be how? 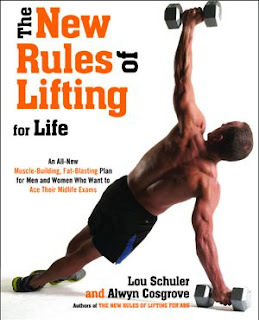 The New Rules of Lifting for Life is a great book for middle age professionals over the age of 50. The authors Lou Schuler and Alwyn Cosgrove have done well outlining a workout routine for those who want to trim their waists while not trying to look like the hulk. It provides a nice overview of techniques for those who desire to maintain or improve their muscle tone at their rip age. It is a book for the long haul and not steroid popping teenagers. A particular nice aspect of the book is that it provides some level of case study about how the muscles work and how they degenerate after a certain age. It also provides some success stories of those who worked out until they are about 70 years old and were stronger than those in their 20’s. The author insists that weightlifting is one aspect but the other half the battle is the diet. One must put the right stuff in their mouth to enhance their training performance. The book will bring you through core training, power training, squats, hinge, lunge, single-leg stance, push, pull, combination exercises and metabolic training. It provides an overview of the right techniques with pictures and form. Form is the one of the most important aspects of training making the difference in building as well as reducing the chances of injury. Even more beneficial are graphs and charts one can use to keep track of their own workouts. The book provided me a greater understanding of which exercises one should use as they get older. You won’t find much in terms of arm building within this book as most of the exercises are for total body fitness. Beginners should always focus on the creation of core training before trying to pinpoint certain muscles. Yet as one gets good at combination sets and core training sets they may desire to find a book more related to specific exercises. If you are a working professional and are in need of tightening this may be the right book for you. Learn how to balance fitness, work, family and hobbies to develop a meaningful and full life. Each aspect can be used to enhance other aspects of your life. For example, exercise will reduce stress and increase workplace performance. Accomplishments in hobbies can broaden your mind and maintain interest in your core work requirements.